My mother had a difficult time crying. She told me years ago that she’d cried so much when my father died that she had no more tears left. And now I finally understand what she meant. I’ve probably cried a river, at least, of tears. Maybe even an ocean. I look back at those times of deepest sorrow….when my father died. When my beloved uncle died three days before my husband and I were supposed to be married. All the times I’d tried to get pregnant, and the answer was “no”. When I had my miscarriage and tubal pregnancy. And sitting in the car in my driveway after I had driven back from Maryland after the last time I saw my mother alive, just crying uncontrollably and inconsolably, because I knew in my spirit that I wouldn’t see her alive again on this earth. All those tears….that night alone I think I soaked my sweater so badly it shrunk. I felt like I’d been deserted, even though my husband came out to the car and sat with me and held me, and then our daughter came out and sat on the other side and cried with me, too…. I think I’ve cried so many tears in my lifetime, I don’t have any more left to cry. All those tears. My sorrows. My heartache. Gut wrenching pain. And not ONE of them wasted. Because in my sorrow, and my lowest hours, the Lord was there, and He had his bottle out and caught each and every one of them, because He never wanted to forget the pain I was experiencing. Because He was there to make it better. As someone said, He doesn’t need our tears, because He has enough of His own from when his only son Jesus was crucified. I find myself wondering at times what my bottle of tears looks like. 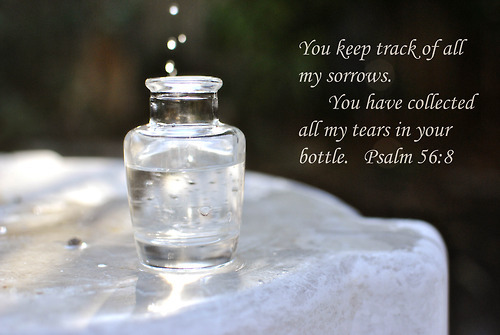 There’s nothing I’ve found in the scriptures to actually describe what our own bottles of tears look like, but after reading the descriptions of heaven, I can imagine a beautiful crystal bottle, with hundreds and hundreds of facets, so many that we can’t count them all. And it reflects like so many rainbows that we can’t even count them all. We know that Heaven is filled with wonders and colors and beauty we can’t begin to imagine in our earthly minds. Our bottle of tears is like that. Because God loves us so much, He takes our earthly sorrows and turns them into immeasurable joys when we finally get into His presence. Sometimes I wonder how in the world one bottle can hold all the tears I’ve cried. Surely some of them have evaporated, or been missed. But God in His infinite mercy and love has saved each and every one, and that one bottle that each of us has with our name on it holds each and every tear. If a day is His presence is like a thousand years, and a thousand years is like a day, can we expect any less? Because I love the beach, I imagine my bottle of tears has tiny starfish and seashells pasted on a delicate sea foam blue glass bottle, with a bit of sand in the bottom, and tied with a narrow string of rope. But I know that whatever the Lord has used for our individual bottles of tears, it’s perfect. Because He selected it especially for us, and has engraved our name on it. What does your bottle of tears look like?